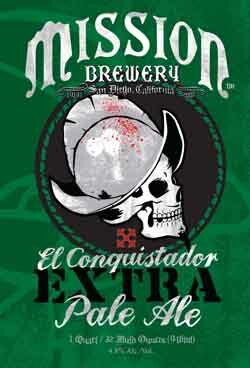 El Conquistador is a sessionable pale ale dry-hopped with Centennial and experimental hops from the Yakima Valley. Mission recently released El Conquistador and Shipwrecked IPA in 32-oz cans. I had a problem. After I retrieved the big honkin’ can from the fridge, I realized that I did not have a beer glass big enough to contain a full quart. So I used a pitcher. It opens with an authoritative chunk of splitting metal. It’s a hazy copper beauty with a fluffy white head that I know will lace the sides. There’s faint lemon and orange zest on the nose, and with a thin mouthfeel and bitter finish, it’s not the kind of pale ale usually associated with San Diego, but will make for a fine beach companion. Given the size of the can, I’m hoping very much that this slightly hazy, pale golden ale is what the English might call more-ish, so let’s see. The nose is fairly innocuous, with soft, perfumey florals and sweet melon notes and just a hint of lemon. The body is light, gently bitter with faintly spicy citrus peel and a bit watery, ending in a somewhat abrupt bitterness that refreshes but fails to leave me craving the remainder of the can. A pleasant enough partner for burgers or hot dogs.